While teaching last week at our Tampa Immersion Event, I mentioned the support for SMB as a storage in SQL Server 2012, which is allows you to create a Failover Cluster without shared storage on a SAN, and is documented in the following Books Online topics. 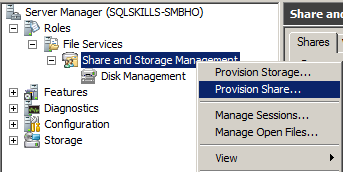 Someone asked the question about whether SMB could be used for the shared storage for a failover cluster in SQL Server 2012, and I had to go do a little research, but I found that it was a supported configuration. 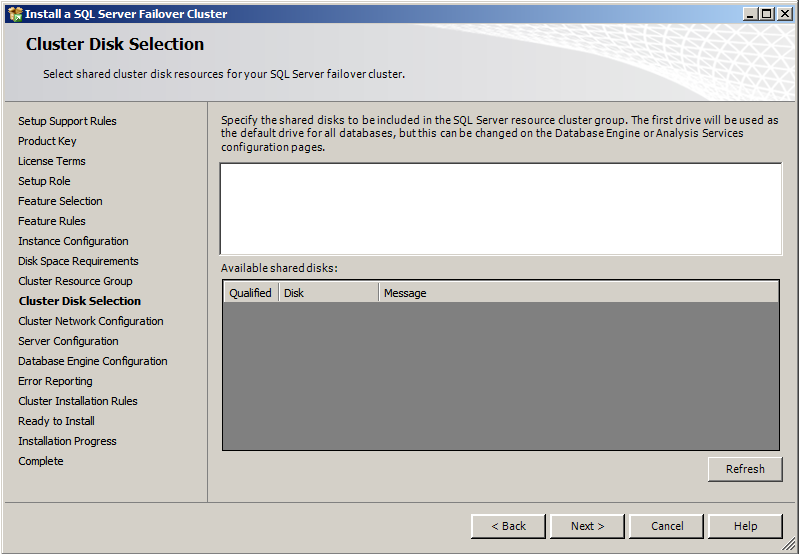 Last year, Kevin Farlee from the Storage Engine Team blogged about the changes in the SMB stack that make hosting SQL Server databases over SMB 2.2 a feasible prospect in his blog post SQL Databases on File Shares – It’s time to reconsider the scenario. Additionally the SQLCAT team, actually Kevin Cox specifically, blogged about the use of SMB for hosting database files in the Top 10 Hidden Gems in SQL Server 2008R2 post. 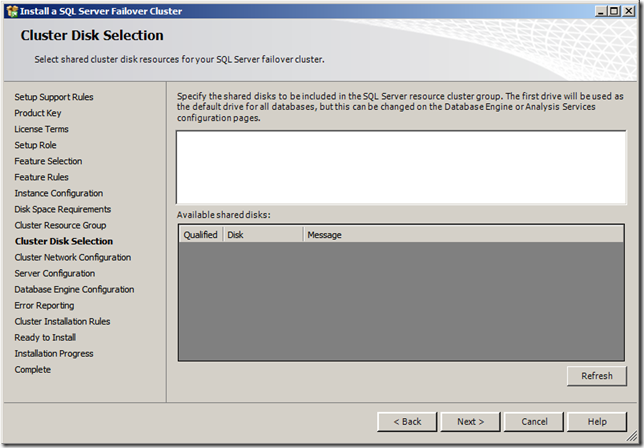 Now that this is a viable alternative to expensive SAN’s it is not surprising to see that it is also a viable storage option for SQL Server Failover Clustering in SQL Server 2012. 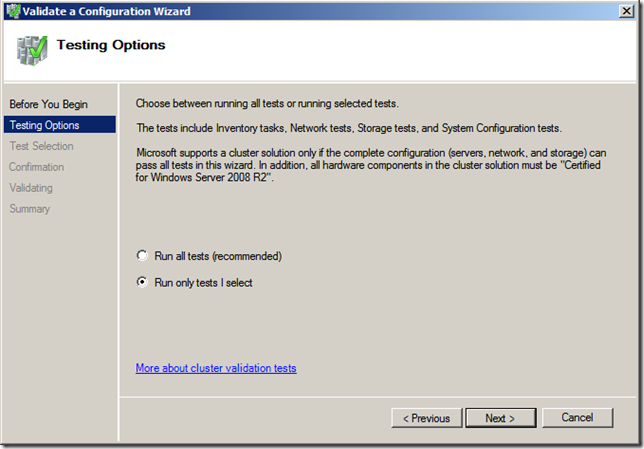 Building the Failover Cluster in Windows is essentially the same as building a standard Failover Cluster for SQL Server, with the exception that you have to skip the Disk checks in the Cluster Validation Tool, and then override the failed checks to actually form the cluster. To do this, select the option to Run only tests I select on the Validate a Configuration Wizard. 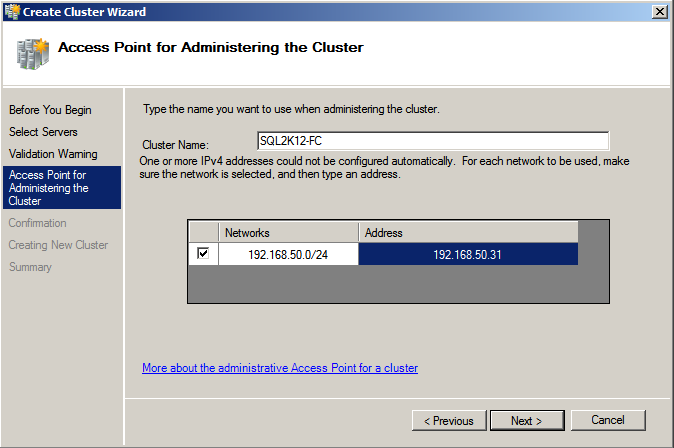 Then collapse all of the parent nodes in the treeview and uncheck the Storage checks and run the cluster validation. 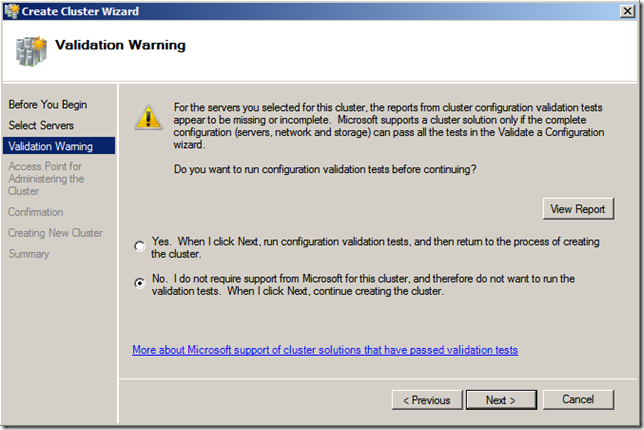 When the validation tests complete, review the report and make sure that you have a supported configuration for failover clustering. 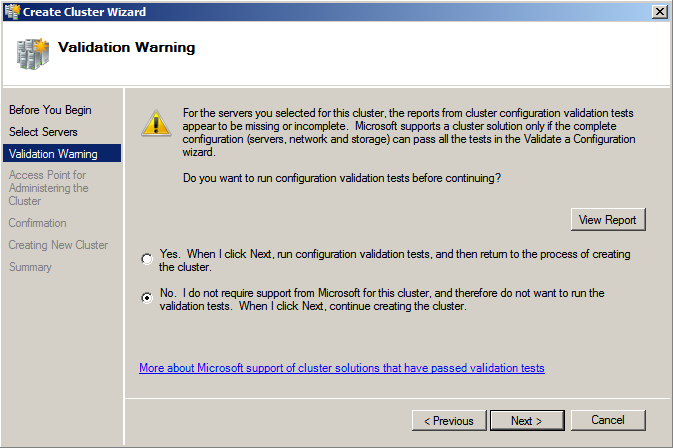 Then click the No option on the Validation Warning page and create the cluster by providing a Cluster Name and IP Address. The first step in setting up a Failover Cluster instance for SQL Server that uses SMB for its shared storage is to configure the File Share server to support the clustered instance being able to connect to it with the appropriate permissions to manage the SQL Server databases. Since there is no shared storage in the environment, there is an additional requirement, if you are using a 2 node Failover Cluster, that the File Share will need to be the witness in the quorum configuration using Node and File Share Majority. The requirements for this are documented in the Exchange Books Online (I tried to find a SQL Server Books Online or Windows Server Failover Clustering Books Online entry that provided the correct details and couldn’t) http://technet.microsoft.com/en-us/library/bb676490(EXCHG.80).aspx. 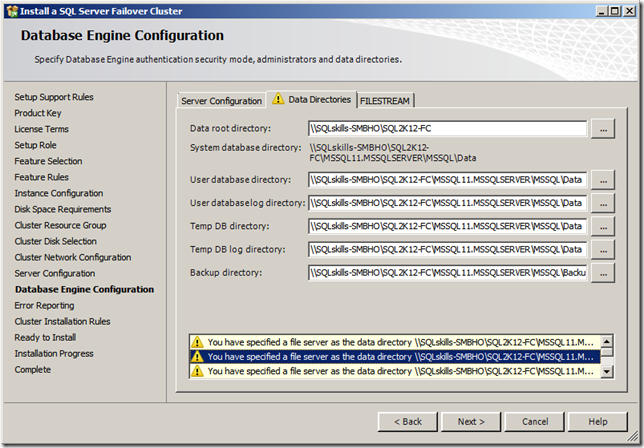 Essentially, you need to have a separate File Share for the quorum, and a separate File Share for the SQL Server instance to use for data storage. 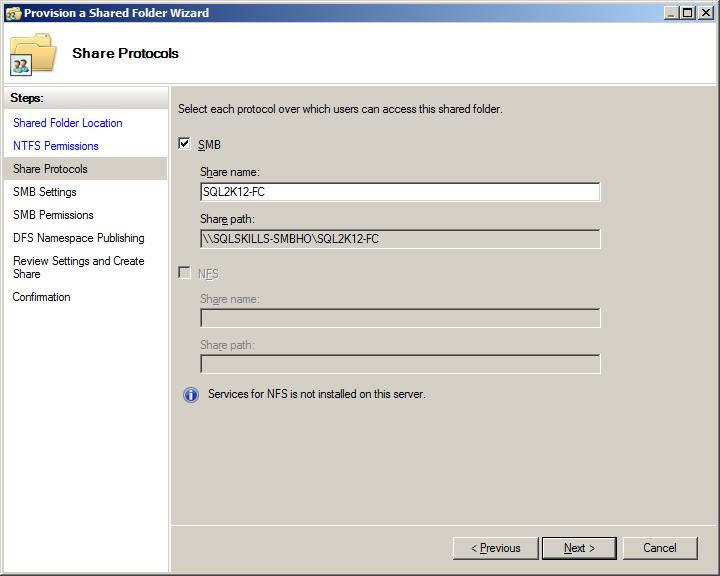 The first thing you want to do is Provision a new Share using the Provision Share context menu item from the Share and Storage Management node on the File Server. 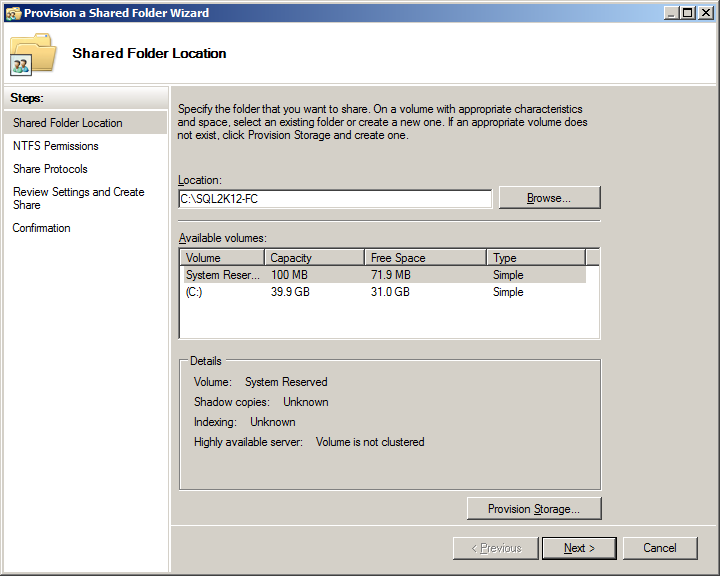 Then you need to provide a path for the storage of the share. If you are actually setting this up, perform all these steps twice to create two separate shares with the necessary permissions. Then you want to manually edit the NTFS Permissions for the File Share being created. 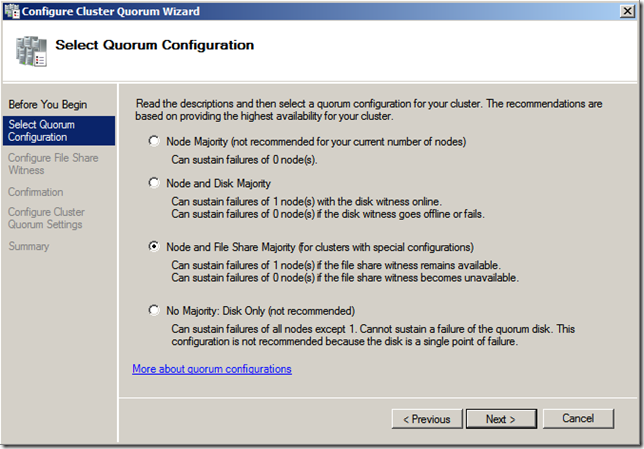 For the Quorum Share, you need to provide the Failover Cluster Virtual Computer Object (VCO) account Full Control of the Share in NTFS. 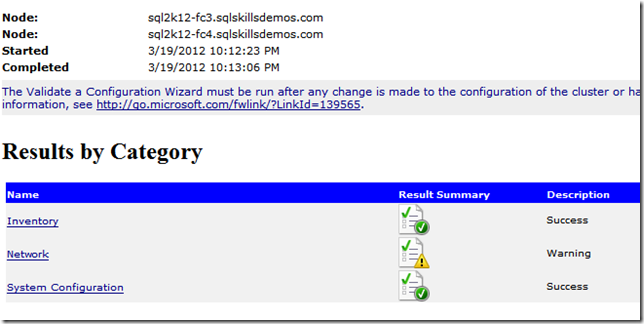 The VCO is the ClusterName followed by a $ in Active Directory, and you will need to click the Objects button to add in the Computers object for the search to find the account. 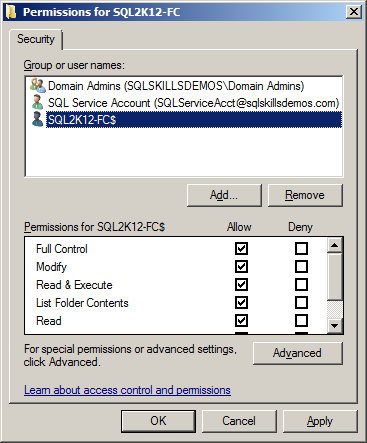 For the installation share, the SQL Server Service Account will require Full Control permissions in NTFS. 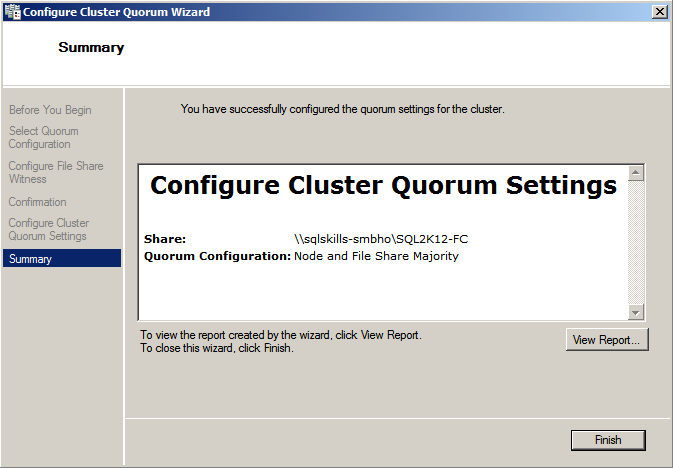 The next step is to provide a name for the File Share(s) that you are creating which will be the path to the share for configuring your quorum and then your Failover Cluster installation. 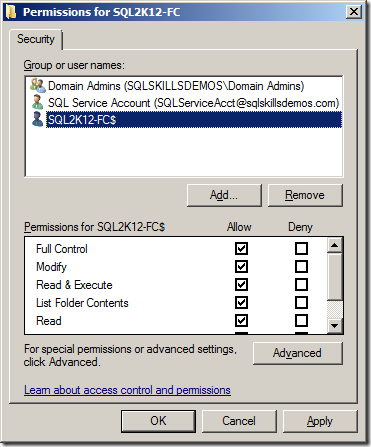 I am skipping over the SMB Settings window and going to the SMB Permissions where you will need to customize the share permissions for the specific Users that need to access the share to minimize security issues in the environment. 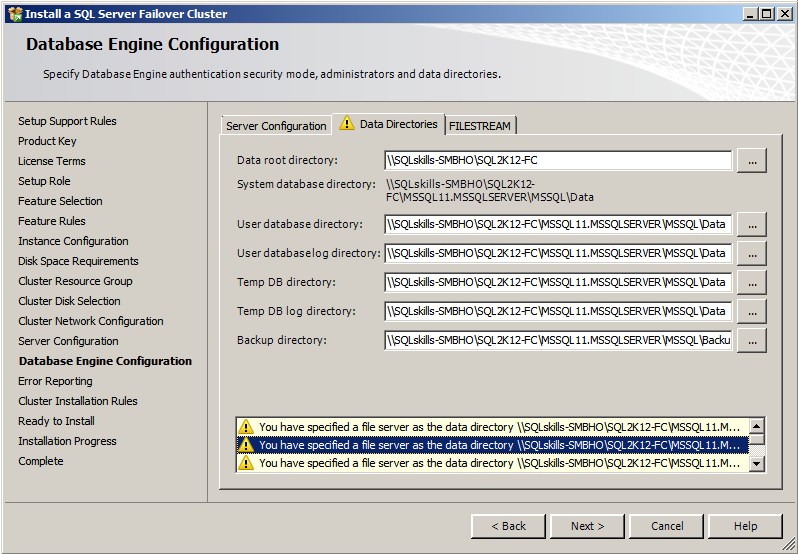 Just like with NTFS, for the Quorum Share, you need to provide the Failover Cluster Virtual Computer Object (VCO) account Full Control of the Share. 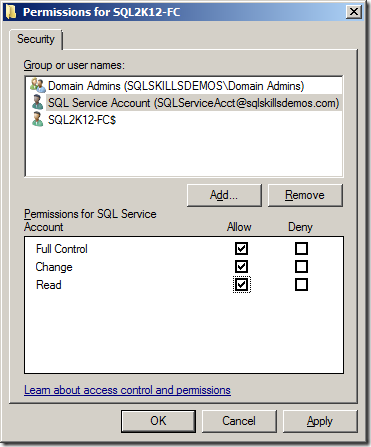 For the installation share, the SQL Server Service Account will require Full Control permissions over the Share. 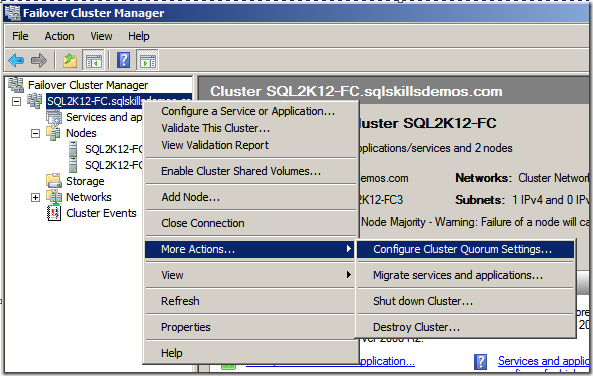 Then create the share and you are ready to configure the quorum settings for the failover cluster. To configure the Node and File Share Majority quorum for the cluster, required only if you have an even number of voters in the configuration which is typical for 2 node clusters, click the Configure Cluster Quorum Settings menu item from the failover clusters context menu. Pick the Node and File Share Majority radio button. 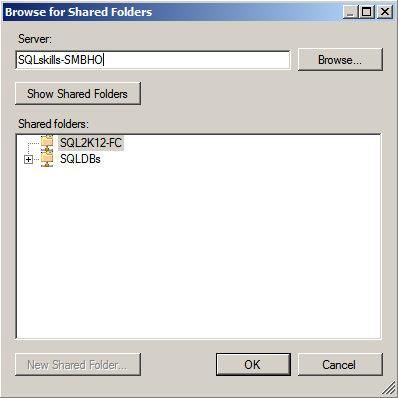 Then Browse for the shared folder and type in the name of the File Server that is hosting the SMB share for the quorum. 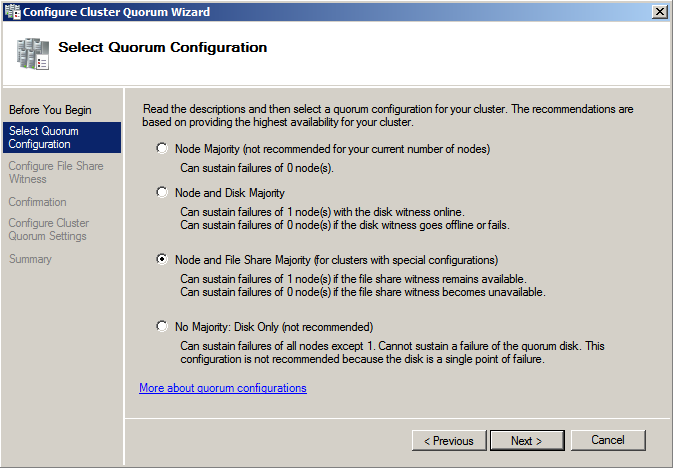 If all the permissions are configured correctly, you will have a successful configuration of the quorum in the environment. 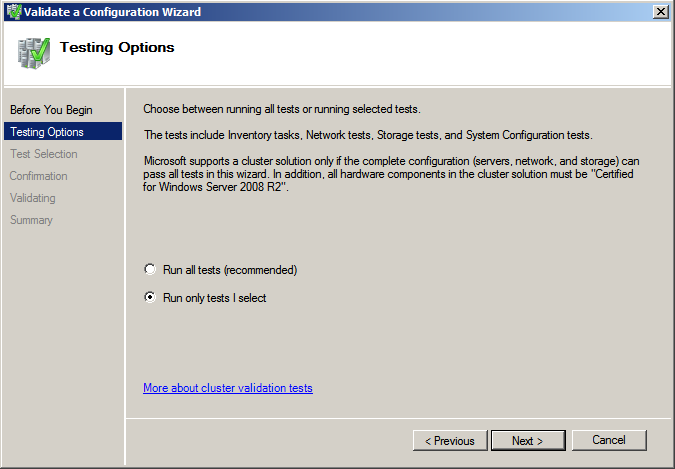 For the interests of brevity, I am going to skip showing all of the standard Failover Cluster installation setup screens and only show the ones that matter for the configuration using SMB as the shared storage. 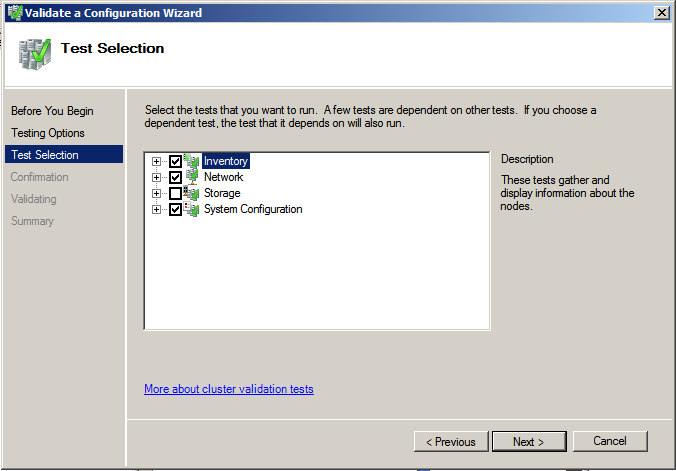 For the instance features in this blog post, the Database Engine, Client Connectivity, Client Connectivity Backwards Compatibility, and Management Tools have been selected for a minimum install in the environment. 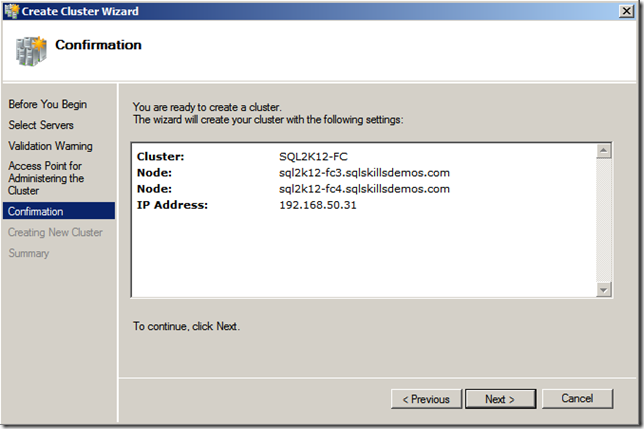 Everything is exactly the same as it would be in a standard SQL Server Failover Clustered instance installation until you get to the Cluster Disk Selection page of the installation. 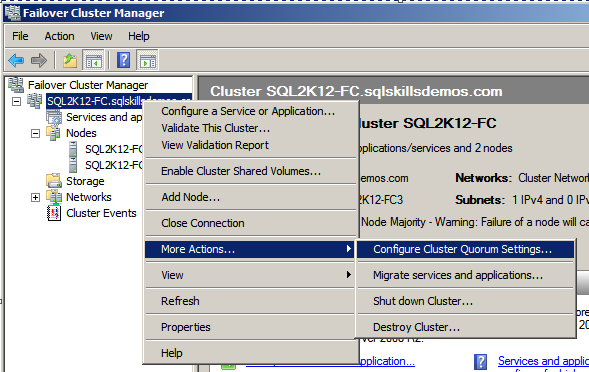 Here there will be nothing shown in the environment, and what is interesting in comparison to SQL Server 2008R2 and previous is that you still have the option to click Next. The next page of interest is the the Database Engine Configuration page, where you will provide the UNC path to the SMB share for the Data root directory, and if you have multiple shares that target different physical disk arrays in the File Server for the instance you could also specify those UNC paths to achieve physical isolation of the I/O for logs, data files, tempdb and backups following best practices. Notice the warnings about the file server being specified as the data directory. 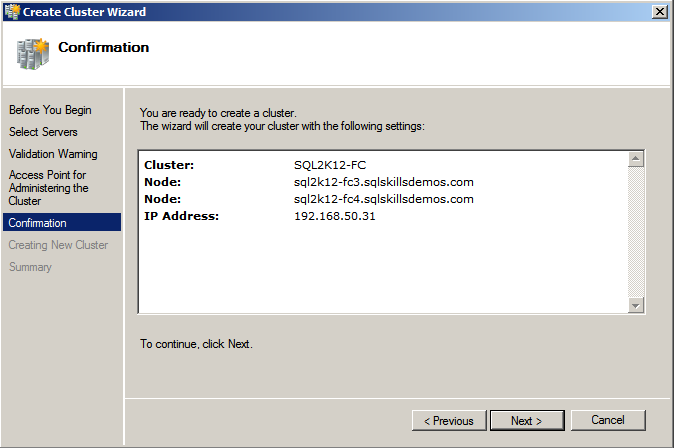 If you double click on one of the warnings it will produce a dialog box similar to the following box. If you don’t get the warnings, don’t worry, you will still get the above warning dialog box as soon as you click Next on the page. After this last warning Setup will proceed as normal only it will install into the File Share everything that would have been on the shared disk in a standard configuration with a SAN. Once the first node is setup, you can then proceed to run setup on the additional nodes and they will work just like a standard failover cluster configuration would against a SAN. 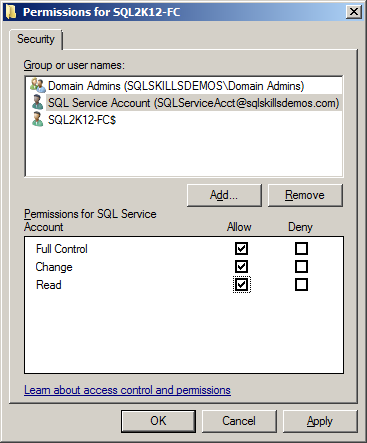 Once all of the setup completes, you can validate the location of the database files using the sys.master_files DMV in SQL Server. 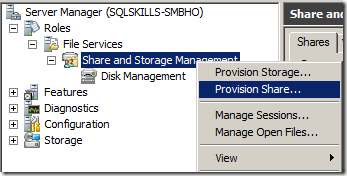 The SMB storage option lets you get past the 25 instance limitation for SQL Server when using shared disks with drive letters assigned, since each instance requires a separate drive letter. Using SMB up to 50 instances can be installed in a failover cluster, which provides a significant increase in the number of instances you can get over using a SAN. The improvements in the SMB stack make this a much more viable solution to expensive shared storage implementations using SAN hardware, but as I pointed out earlier, there are still considerations that should be made about the level of redundancy and other benefits that are provided by SAN implementations before you determine that a SMB solution for shared storage in a failover cluster is appropriate for your specific environment.